Father’s Day should be a time for families to enjoy spending time together. For some 30,000 families again this year, gun violence has removed a member or members of such a celebration. That is nearly 100 people that lose their lives in America every day. 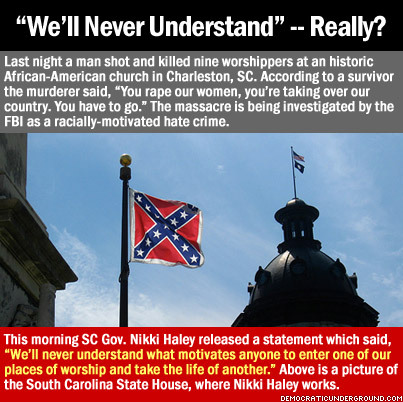 High profile cases such as the racially motivated murders in South Carolina Wednesday night serve as a slap to wake us out of our stupor – a stupor induced by murder and suicide by gun being a many times a day happening. Last Friday night a young woman was shot to death in cold blood at the mall in Coralville. While it was shocking for Iowa, in the large scheme of an American day it was just another death by gun. But for that family and those families in Charleston, S.C. there has been an unbelievable, horrible alteration in their respective worlds. Hearing of such deaths on the news or TV somehow becomes so much background noise. Often we think to ourselves “nobody will do anything about this so why bother?” But at some point gun violence will touch your life in one way or another. A friend, a relative, a close family member, a parent, a grandparent, a neighbor. Two and a half years ago many thought the massacre of young, innocent children just before Christmas would finally be the spark that would spur enough outrage from voters that politicians would finally be able to reach into the recesses of their souls and find some courage to stand up to the gun lobby. Sadly, just as certain as there is gun violence in America, there are politicians who are too scared to stand up for Americans against the gun lobby. Here we go again just as after Sandy Hook, we have another high profile slaughter of innocents. People who died simply because of the color of their skin. Just as before, the very next day the gun lobby shuffles out their paid for politicians and their TV model talking heads to quiet the talk. 1) Every gun must be insured for liability, just like a car. I would add there should also be medical insurance also. If a weapon is stolen, the owner is still liable for the damage done by that weapon until it is recovered and dismantled. 2) Before a gun is sold by a merchant, proof of insurance must be proven by a prospective owner. In a private sale, insurance and liability on that gun is held by the seller until the buyer gets insurance. 3) Safety must be engineered in. The simplest thing to do is that every gun must have some recognition system for the owner, whether it be eye scan or fingerprint recognition. Upon sale, licensed dealers would be authorized to change recognition system for new owners. Engineering safety in is always better than relying on procedures and promises. 4) Taxes for sales of guns and bullets should be added to finance compensation programs for victims of guns. There is no reason for taxpayers to pay the hospital costs, funeral expenses and social service costs for victims of guns. Those costs should be borne by those who buy the weapons. 5) Background checks must be stringent. Mental health facilities must be restored. All of the above are market based solutions. All are doable if WE THE PEOPLE (who are ultimately the government) make eliminating gun violence a priority and vote for politicians with guts that will stand up to the gun lobby. At one time cars were extremely unsafe. It took a while, but through legislation, regulation and public pressure the car you get into today is much much safer than its predecessor 50 years ago. This problem won’t be solved overnight. Safe autos are still in the works. But we must stand up and demand that we start now. BTW – here are some interesting stats on use of guns to stop other guns. In short, it seldom happens. This entry was posted in gun control and tagged Charleston, gun violence, market solutions. Bookmark the permalink.